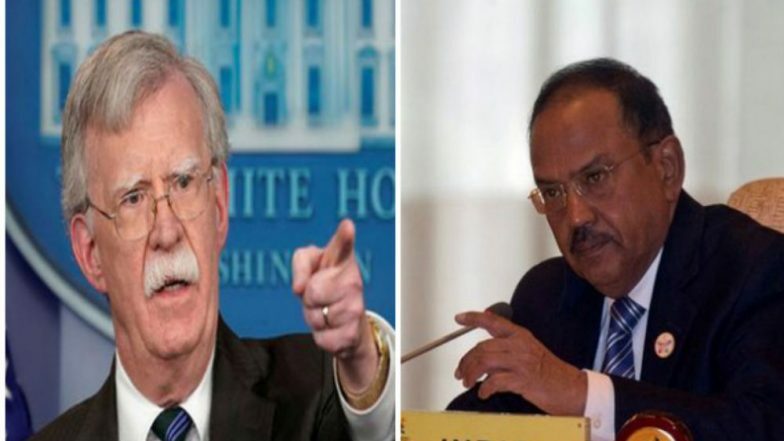 New Delhi, February 16: National Security Advisor Ajit Doval had a telephonic conversation with his US counterpart John Bolton on the evening of February 15, said reports. The call was initiated by the US side to express condolences and outrage over the Pulwama Terror attack by Pakistan-based terrorist group Jaish-e-Mohammad (JeM). CRPF Jawans Wreath-Laying Ceremony: PM Narendra Modi, Rajnath Singh, Nirmala Sitharaman, Rahul Gandhi and Others Pay Last Respect to 40 Martyred Bravehearts of Pulwama Terror Attack in Delhi. US National Security Advisor John Bolton supported India's right to self-defence against cross-border terrorism. He offered all assistance to India to bring the perpetrators and backers of the attack promptly to justice. NSA Doval appreciated US support and hoped for swift action, said reports. List of Jawans Martyred in Pulwama Attack: Names and Photos of 40 CRPF Bravehearts Martyred in JeM Terror Strike in J&K. They vowed to work together to ensure Pakistan ceases to be a safe haven for terrorist groups that target India, US and others in the region. They also resolved to hold Pakistan to account for its obligations under UN resolutions and remove all obstacles to designating Masood Azhar as a global terrorist. The Narendra Modi led Central government has also called for an all-party meeting today, which will be held at 11 am in the Parliament library for deliberation on the Pulwama terror attack and security situation in Kashmir. Pulwama Terror Attack: All Party Meeting in Parliament Library at 11 AM Today. On Thursday, February 14, a bus carrying over 40 CRPF jawans, which was part of a convoy of 78 vehicles with 2,547 CRPF personnel moving from Jammu to Srinagar, was attacked by an SUV laden with explosives in Pulwama, Awantipora area. The dastardly attack martyred 40 CRPF jawans and seriously injured over a dozen jawans. Jaish-e-Mohammad claimed the responsibility for the terror attack and identified a 20-year-old Pulwama local turned suicide bomber Adil Ahmed Dar responsible for the Fidayeen style attack.